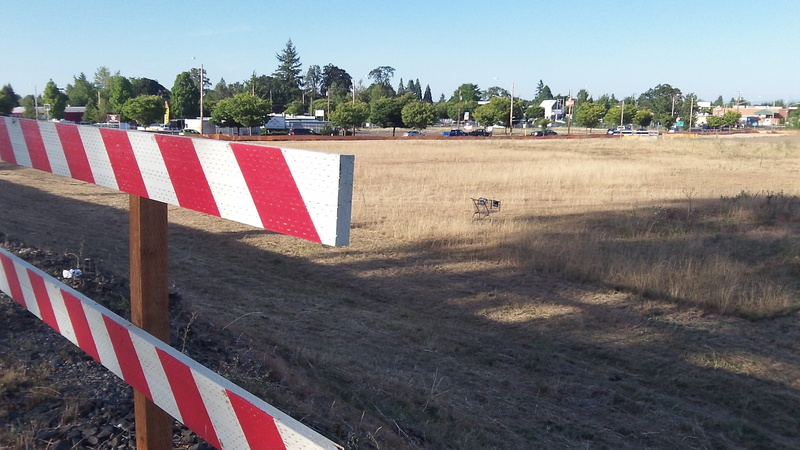 A lone shopping cart on the vacant Lowe’s site: Maybe it’s a start. Lowe’s proposal to build a store at Ninth and Oak Street has been an expensive proposition for the city of Albany so far. The city spent around $5 million on street work and related improvements, in return for which the company promised in its development agreement with the city to have the store open by the end of 2014. Now that the timely opening is not going to happen, the company wants to change the deal. Lowe’s request is on the agendas of the city council’s work session Monday afternoon and the regular meeting Wednesday night. The company wants to open the store a year later, by Dec. 2015; to build it 35 percent smaller than specified in the original agreement; and to be forgiven the $1,000 daily penalty for not opening by Dec. 31 this year, a penalty that will reach $365,000 if the store does not open before Dec. 31, 2015. For the council. it’s a tough decision. If it tries to enforce the original deal, it’s possible the store won’t be built at all and all that street money will have been spent on improvements that could have been done later or not at all. If the council agrees to the changes, there are still no guarantees. The experience so far reminds us all that an agreement can be broken. With that in mind, it’s possible Lowe’s might refuse to pay the $1,000 a day (up to $2 million if the store is never built), and the city would have to sue the company. That would be Albany suing the second big company for failing to live up to its promises to build something in town. Pepsi subsidiary SVC was the first. Not exactly the best way to attract employers, is it? In the world of business, especially big corporate business where decisions are made by executives far away, and where decisions are necessarily influenced by sudden economic changes, expansion and construction plans do have to change now and then. That can be a problem especially when the lead time imposed by the jungle of state and local regulations — on transportation and wetlands and so forth — runs into years. Problem well stated Hasso. I’m pulling for Lowe’s building that store-it would be great for Linn County. I’m beginning to wonder if the economic development process to attract big business to a community (any community) needs a revaluation. It has always made sense (to me) to make it as easy and attractive to build in a community, everyone benefits in the end, but the process is certainly creating more problems then it resolves. I don’t have any ideas how to fix it – only that it needs to change. Tough one…it was designed for bringing us jobs and services we so desperately need. Again-well stated Hasso.. I imagine that our illustrious city council will screw this deal up as well. And given the City of Albany has a reputation for being overly litigious, it would appear another ugly legal battle is on the horizon. But it is axiomatic that a bad settlement is better than a good lawsuit….unless you’re the highly compensated city attorney. I doubt our council has the will to overrule his desire. One again Gordon jumps from the plane without a parachute. “…overly litigious..”, talk about hyperbolic nonsense. Everyone likes to jump to the conclusion that enforcing contract rights makes a “problem”. In this case, as with Pepsi/SVC, these companies entered into these contracts willfully and without any coercion at all. In fact, they stood to directly benefit their bottom line buy gaining from improvements that the public would make to assist their operations. Enforcing contract rights occurs every day. It is the backbone of a well functioning economic system. Home Depot, a competitor of Lowes, is probably chuckling about how that company made some bad decisions about timing and sizing. The free market system says that they should pay a price for their bad decisions. The city has done what all cities do and what their citizens demanded: work to foster the economic growth of the city. They have done that repeatedly and continue toward that goal. Nothing, and I mean nothing, has been reported that shows that the city did anything improper or untoward in regards to Pepsi/SVC or Lowes other than to help them bring business to the city. The fact that those companies made bad decisions is their fault and their fault alone. If Lowes wants to adjust their promises, then they need to put on the table options that work for them while keeping taxpayers whole. What we see happening is a negotiation, not a capitulation. Litigation does not scare big companies. That’s why they have attorneys to advise them before they sign contracts. What other companies see form Albany is that the city kept every promise they made and did so in keeping with their contracts. They see that the city is a reliable partner that keeps its word. The also see that the city expects those businesses to also keep their word. Which is exactly what all people seek in their transactions in our free market system. It seems to me, that this so straight forward, that the city should have no problem winning a lawsuit AND being compensated for attorney fees. Isn’t the “City Attorney” already compensated? Why would we have to pay him again to actually do something?